Our aggression expert, Jeff Silverman, has successfully rehabilitated hundreds of aggressive dogs over the last 20 years. He has written about aggressive dogs for national professional magazines, lectured on the topic for local veterinary associations, and trained veterinary and animal shelter staff on safety with aggressive dogs. We need to evaluate your dog in person to determine which training program best fits your needs, but we offer free 20 minute phone consults with our aggression specialist, Jeff. After some discussion, he can usually give you a general idea of the severity of your dog’s aggression and what might be involved in addressing it. The phone consult is no substitute for a face-to-face evaluation, but we can usually give you an idea of what you’re getting into. Contact us today to schedule either a free phone consult or a complete in-home consultation. 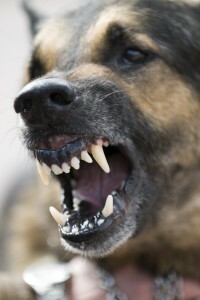 Early intervention is key: Dogs don’t “outgrow” aggression problems. Practice makes perfect. If your dog has behaved aggressively, have him evaluated both by your veterinarian and by a behavior professional. The sooner you start, the easier the problem will be to fix. Don’t try this at home: Some of our most difficult cases involve highly experienced dog owners and even trainers whose attempts to solve an aggression problem with inappropriate traditional obedience training techniques backfired. Safety First: Until you see a professional, do whatever it takes to keep people safe and prevent your dog from practicing aggressive behavior. Keep your dog securely confined or leashed and avoid cicrumstances that trigger aggression. Consult Your Veterinarian: Medical factors often play a role in aggression. If your vet didn’t refer you to us, please consult them. Description: Some dogs guard food, bones, toys, sleeping spots, or a favorite person. Resource guarders can also be touchy about being lifted, restrained, or groomed. When aimed at humans, resource guarding is the easiest type of aggression to address. Our success rate in homes with no children under 8 is pretty close to 100%. Homes with young children are trickier. Programs: Mild resource guarding can often be handled with just the behavior consult and some remote support. More serious cases may require coaching, intensive in-home day training, or board and train programs. Description: Many dogs are afraid of strangers in general. Others only fear certain people. Common fear aggression triggers include gender, age, body language, and race. Some dogs display fear aggression towards family members, but this is less common. The amount of training required to overcome fear aggression varies greatly from one dog to another. Programs: Most of our dogs with fear aggression go into our semi-private Stranger Danger group classes. Mild and moderate cases can usually start this semi-private class immediately after their consult. More serious cases may require private training through our coaching, in-home day training, or Total Immersion Board and Train programs. before they are ready for the group setting. Description: Many otherwise friendly dogs become aggressive on leash, behind a fence, or in their crates. This type of aggression can usually be addressed quite easily with early intervention. Allowed to continue, however, the aggression can generalize to multiple situations and become a serious project to address. Programs: We typically address territorial aggression with private training like coaching, intensive in-home day training, or board and train programs. Description: Aggression aimed at other dogs can fall into any of the above categories, but requires a different approach than human-directed aggression. Humans working with aggressive dogs can follow very specific instructions about how to act, which makes training easier. Other dogs don’t tend to be so cooperative, so we have specialty classes for this type of aggression. Programs: Most dogs who are aggressive to dogs that they don’t live with are best served by our semi-private Growly Dog classes. Most dogs can go straight into Growly after their behavior consult while others need private training before joining a group environment. Dogs who are fighting with dogs they live with more typically require intensive obedience training in your home through our coaching or day training programs. Description: Most aggression that we see falls into one of the above categories, but there are also a wide variety of medical conditions that can lead to aggressive behavior. For that reason, we strongly recommend consulting both your veterinarian and a behavior professional if your dog is behaving aggressively. Programs: With abnormal aggression, we work in cooperation with your veterinarian or a board certified veterinary behaviorist. The veterinarians usually drive this process and we help you implement their recommendations.